Last Thursday in 4/5 we had a chef, Stuart Rees, come to our classroom. He talked about places that he has been. When he was little he wanted to be an archaeologist. He used to go to his Grandma’s and watch her cook and he used to read his Mum’s cooking magazines. His Mum told a chef that he liked to cook and he had some work experience in the kitchen where he washed dishes and mopped floors and he didn’t like that very much because he wanted to cook. He used to make banana cake and he gave each of us a little cake each. Banana cake was the first thing he ever learnt to cook. He never followed the recipe because he just did it his own way. He gave us a copy of his recipe for banana cake. When he was 16 he entered a cooking competition and he had no idea of what he would cook. In the end he made pate and he came second. He still has his cup that he won. There was poster at his work and it was advertising a trip to China to help teach kids to cook Australian food. He went to China for 4 months and he taught Chinese children to cook and this was hard because he didn’t speak Chinese and the interpreter sometimes made mistakes. His favourite dish that he invented was with an oyster and a raw prawn wrapped pastry and cooked. He loved it but some of his work colleagues were not so sure. What is your favourite dish? Have you cooked banana cake? Please leave a comment sharing your thoughts. Last Thursday in 3-4 Blue and Yellow we a chef, Massimo Mele, come in to our classroom. He came to show us how he makes a pizza called a calzone and tell us how he became a chef. He told us about becoming a chef. He started cooking at the age of 10 and then he was interested becoming a water policeman but instead he became a painter and a builder before he was a chef. His Mum and Dad used to own a restaurant and it served Italian food. His whole family worked at the restaurant to help. His first ever meal he made was a fish curry. He had his own restaurant in Sydney but he has now moved back to Tasmania. In Launceston he now has a new restaurant called The Grain. To make our pizza we had to flatten our pizza dough and then we put cheese, ham, zucchini and parsley on top of the dough. We folded it in half – like a taco – and then it was deep fried in vegetable oil. Have you ever made calzone? Do you like pizza? Please leave a comment sharing your thoughts. We have come to the last week of term and the final sharing about our playground investigations. The 5/6 and 4/5 classes have completed their double page spreads and their book is done. Each section shares the idea that a pair of students worked on as a suggestion to solve one of the two problems their class worked on. Here is the list of possible problems that our 6 classes are now working on. When publishing their work each group needed to think about the content and the layout of the page so that their readers will clearly understand each idea. By using Book Creator the groups were also able to add audio to their page to add more information. Follow the picture link to read about the ideas for our playground by the 5/6 and 4/5 classes. What do you think about the ideas dreamed up by our classes. Have they given you any good ideas. Please leave a comment sharing your thoughts. All of the classes investigating our big question – “Does our playground meet our needs?” – have been working hard to come up with a solution to the problems chosen for their class. Students worked with a partner to created a double page spread sharing the final idea that they explored with our design process planning sheet. By doing this this they have come to the last stage of the design process we have been learning about – Share. Time constraints and a planned excursion to explore some nearby playgrounds has limited the time that our grade 3/4 classes had to spend on the improve section of the design process but everyone has been able to share their ideas in a book created using the Book Creator app. The other four classes are still working on their ideas and will share their book in another blog post. Mrs S has shared the book online so that our classes can share our ideas with other classes, teachers, parents, grandparents, aunts, uncles, carers, sisters, brothers and any one else who may be interested in seeing their creative ideas. Click on the cover of our book to read about our ideas. What do you think about the ideas dreamed up by Grade 3/4 B and Grade 3/4 Y. Have they given you any good ideas. Please leave a comment sharing your thoughts. 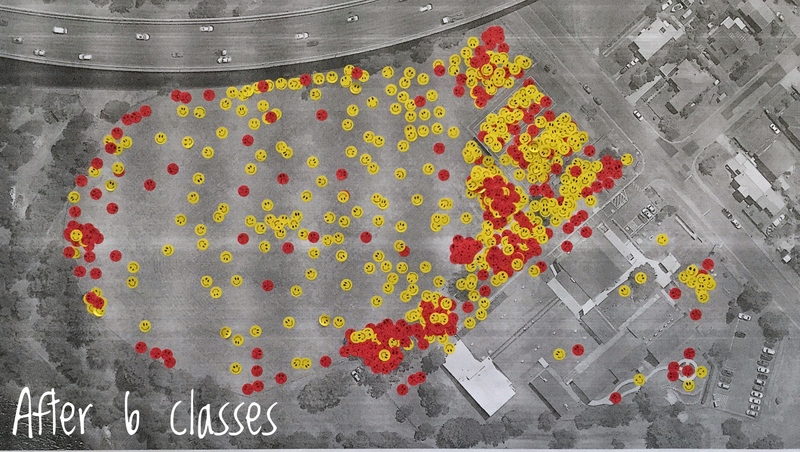 After adding all of our dots to our satellite image the classes worked with a partner and in whole groups to come up with some survey questions that would give us some more information about our needs in our playground. Mrs S collated these and looked for the commonalities between each class to create an online survey for all the classes to complete. During the time each class spends with Mrs S and their class teacher students completed the survey. It was very interesting to see the results automatically update as each student submitted their answers. Our classes all saw how efficient it was to use an online survey tool that collated the results as they were entered and created graphs of the data. The survey data added more information about where students like to play and also what they like to do outside. We found out that our oval is the most popular play area and the second most popular spot is our netball courts. There are quite a number of students who would still like to be able to play in the junior playground. Some of these students like the sheltered areas that are there and other would like to play with brothers and sisters. After talking about our results it was time for each group to try and identify some playground problems. Mrs S and our teachers reminded us that we were searching for solvable problems. We found that some problems were people problems, others were space problems, some were safety problems and some were more to do with dreaming of changes we could make to our outside play area. After working with all 6 classes Mrs S was able to come up with a list of eight ideas. Each class narrowed this down to two and are now focused on imagining clever solutions. We will be trying to persuade others about our ideas by creating a presentation that describes the solution we have imagined for each problem. Which problem would you choose? How would you solve it? Please leave a comment sharing your thoughts. This term we have started to explore an inquiry question. Using the design process we are asking questions and collecting data to find out if there are any problems that we might be able to create a solution to help solve. Our big question seems simple but when we started to think carefully each class found that it led to many more questions and the need to do some research and collect some data. As part of our data collection Mrs S put up a large satellite image map of our playground and each class was invited to add their data. Each class was asked the same two questions. Where do you love to play in our playground? Is there anywhere you do not like to play? Where? Every student was given 3 yellow smiley face stickers and 3 red frowning face stickers so that they could add them to the large image. After having time to explore a colour satellite image from Google Earth everyone was able to add their dots to the map. You did not have to use all 6 stickers. We were collecting visual data about where we like to play. After each class had added their dots Mrs S took a photograph so that we were able to see how our data changed over time. Some of the areas in our playground became so covered with dots that there was a slight mound when you carefully touched the map. Layers of dots covered the ones underneath. What questions do you have about our collected data? Are you wondering why each dot was placed in a certain place? Please leave a comment sharing any questions you might have. On the 16th of November we had an assembly, one the classes that shared was 1 Youd. They talked about the narratives they wrote. They firstly shared about the types of things you need to make a story like, a heading, a story line and other things like that. Then they all shared the name of their story. All of the stories looked great. They also did a drawing on the front cover of their book and did an amazing drawing throughout their books. Towards the end of their presentation one of the students read their book to us. It was about a crazy house. It was really well and it was really funny. It looked like everyone enjoyed the presentation a lot and it got a massive clap at the end. Do you enjoy writing stories? What do you like writing about. Please leave a comment to share your thoughts. On the 16th of November we had a very special visit from Tassie Devil Monster Truck . Everyone enjoyed it. Two students created digital posters about the visit. Troy talked to the whole school about how Monster Trucks work and about the way that they were put together. He also told us how they are shipped to Australia from America. They are now all built the same size. The tyres were huge – $9000 per tyre. That is WOW! Have you ever seen the Monster Trucks? Would you like to drive one? Please leave a comment to tell us your thoughts.